Since I am back from Bogota I have been too busy to write another blog entry. Since preparation for the next national competition is already ramping up it is about time to publish the final bits of information according to my national and WBC performances this year. Lets start with the signature drink. Creating a signature drink can be a quite frustrating thing. Nevertheless, as more as you understand your coffee and aroma pairing in genral the better it gets. 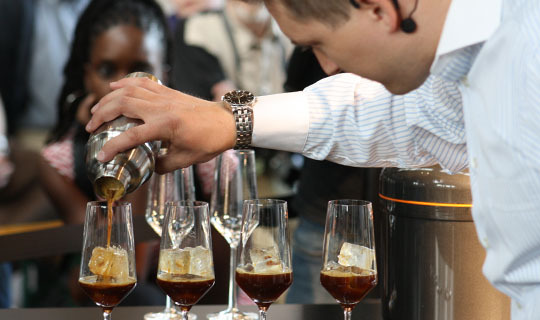 The signature drink that I created for this years German Barista Championship and the World Barista Championship had one major aspect in mind: simplicity. Showcasing the greatness of coffee without using many ingredients. The goal was to let the coffee speak for itself and to present a complex and diverse drink. In the beginning I was looking for a very long time for a coffee that I would use for the drink. The coffee I found is from Ethiopia, from the Sidamo region and has been collected around the town of Neji. The name of the coffee is Nekisse, on of the great achivements of ninety plus coffee. This coffee has grown on a volcanic soil at 1800 meters altitude and has been naturally processed, giving it intense fruity and berry notes, mainly strawberry and raspberry. I still have some green coffee left and you can get it roasted freshly here at backyard coffee. After finding the coffee I developed the roasting profiles. I was looking for a profile where I could maximize the fruity notes of the coffee. Developing the profiles took around eight weeks, where I compared the different profiles and had a look how they matured (or not) upon aging. Finally I found a profile that produced what I was looking for, an intense fruity espresso. The “downside” was a higher acidity in the cup, that had to be balanced out. The next thing was to balance out the acidity and to add some additional elements to the coffee. Again, I kept the focus to not alter the coffee or if I have to, to keep the changes to a minimum. Since dilution can be quite handy if playing with aromas as well, I started working with different types of water to balance out the acidity. In the beginning I did not get anything that was improving the overall drink. Adding one type of water solved the acidity issue while the aromas were dimished. The mineral content of the water played a major role in the perception of the aromas. I ended up having best results using a distilled water. Distilled water was reducing the acidity to a pleasent level and was keeping the aroma profile. Distillation, great thing to be done live on stage. Distillation for itself seemed to be a litle uninteresting for itself. No big achievement here, adding distilled water to an espresso is not a major thing, right? What else could I do? I came up with the idea of using a rotary evaporator. If you are familiar with chemistry you might know rotary evaporators already. If not, you can find a description on Wikipedia. This device has made it into modern cuisine, mostly molecular cooking. It is used to separate aromas from liquids and other content. For molecular cooking aromas are taken from one material and infused into others, this can be done using an evaporator. I still like the idea but it has several flaws. First, the price tag of such a device is too high. I would use it once during the competition time and might not need it afterwards, spending 3.000,- EUR thus seemed a litle high priced. The second issue is the time required for one evaporation process, which would exceed anything that is possible on stage. I still liked the idea of gathering aromas and enriching the drink with it, without actually adding an ingredient to the drink. After some consideration I came up with the idea of combining a destillation apparatus and some kind of aroma evaporation. The idea I was coming up with is to add an aroma chamber to a distillery. The apparatus consisted of three elements. A water heating area to produce vapour, an aroma chamber into which the vapour is directed and that contains fruits and finally a cooling area where the vapour could condense back to water. 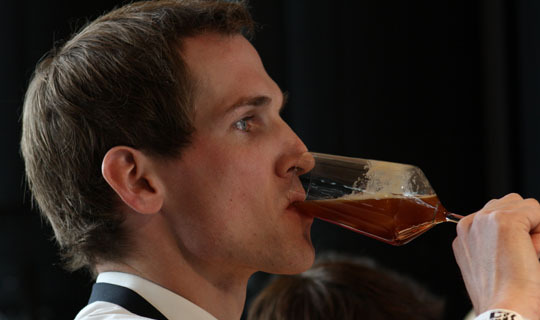 The idea was that the fruis – in the competition I was using raspberries – would release their aromas into the vapour. I went to a company creating laboratory equipment and having their own glass blowers. After they laughed for a while about my idea they started building the first prototype and I was ready for testing. Well, the first two prototypes just blew up since there was always a congestion somewhere. It took us two weeks, to get the first running (technically) version of the apparatus ready. The process worked but it did not produce the desired outcome, just astringent water. Over a period of eight weeks we changed the heating capacity, the angles and sizes of the tubing, the size and direction of the aroma chamber, the way of cooling. Three months later I had it running as I wanted it to be: distilled water, containing rasberry aromas, nice! I had a great espresso that I could balance out with the distilled water. Nice, but still not enough. So I decided to cool it down for a test an was amazed by the result. Refreshing, colourfull, complex. But still there was missing a piece, some kind of extra, soemthing that could help to enhance the experience even more. I came up with adding cold sparkling water to it. Wow! The carbon dioxide helped to transport the aromas faster to your nasal and retronasal pathways and it gave a tactile stimulus to the tounge. Great! Wow, so much for keeping it simple! But very well executed, I’d have loved a sip or two of it!